Hello. I bought the plans last spring, and have since built 3 trees. These plans are the best! 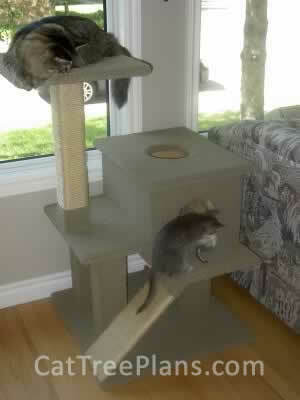 Today, I finished the 3rd one, and here it is after presenting it to Morkmer (top) and Milo (bottom). Thanks from Anchorage, Alaska! Thanks for the plans. They were very well written and easy to follow. I started out with the simplest one. Picture attached. Note that I substituted a 2x6 for the angled support because I had a piece and thought it would look nice. 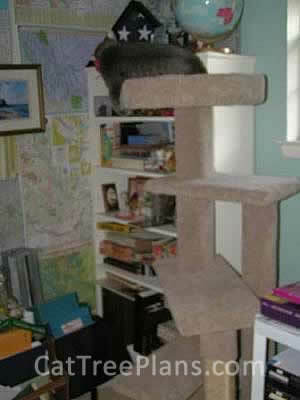 The plans make for amazingly sturdy cat trees. 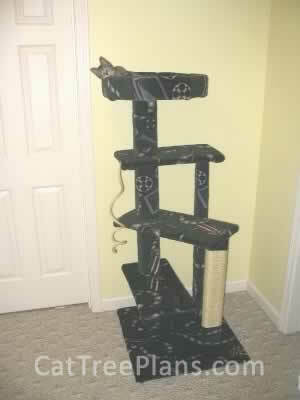 I've purchased different cat trees from my local pet shops and they last less than a couple months, but the tree i made using your plans lasted years. 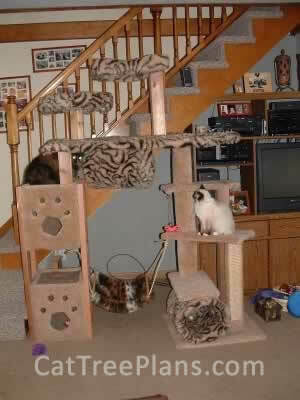 Here is a picture of Grizabella's Staircase that we just built for our new kitten Lilly. The plans were very easy to follow and we had a great time making it. 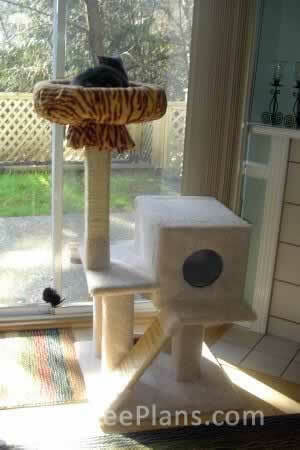 And Lilly loves it! 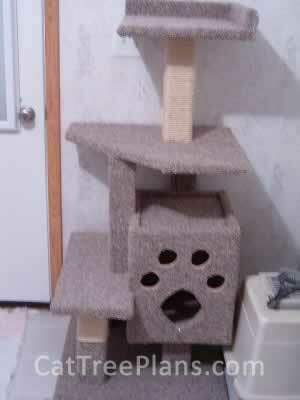 I finished my Kitty Condo this weekend! It took me all weekend to complete, but it was worth it! 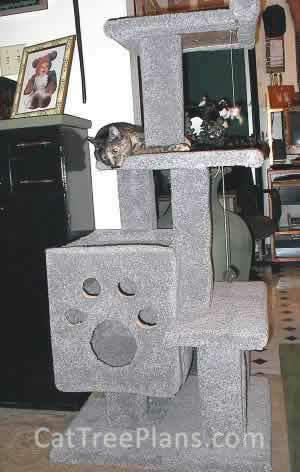 I've been incorporating play time with the condo to allow her to associate play time and fun with the condo so she will feel at home with it. It is part of a regimen I'm attempting in order to reverse bad behavior habits when I have company over (hissing and lurching). So far, it is working and kitty is responding well. 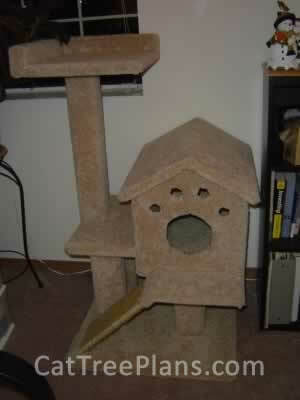 It will take time to determine the effects, but i am so happy to have found these plans so I could make a condo all for kitty! I have such a sense of pride to tell people "I Made It!". 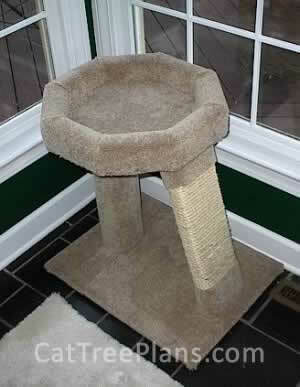 Overwhelming response has been that they "love the kitty paw on the front". Thanks, again for developing these plans! 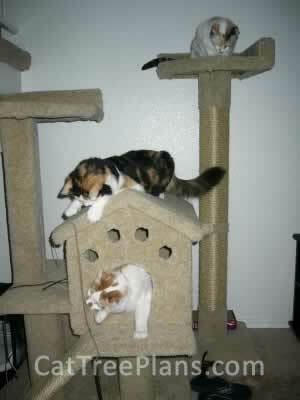 Thanks for the great cat tree building instructions. They were perfect, even for a beginner like me. I have attached a few photos of the completed project. 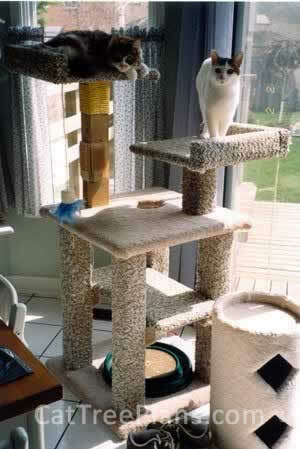 As you can see, I added a separate tower to your plan. The tower is actually quite stable. 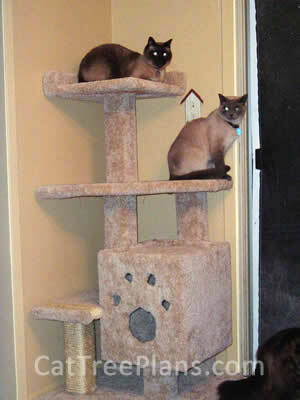 It is connected to the cat house using a support beam which provides plenty of support even when the cats are chasing each other up, down, and around the tree. Thank you again. 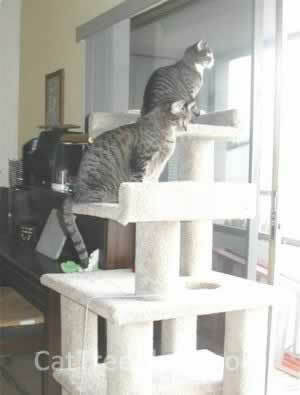 This is Pixel and Jazzy on the tree. 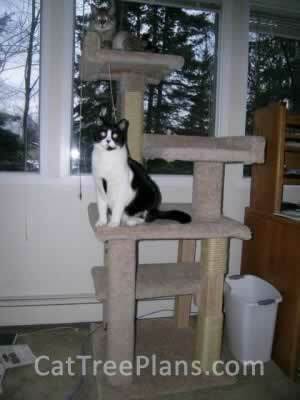 My son, Ryan made the cat tree as a school project. He received an "A" for his project! Thanks for such great plans! 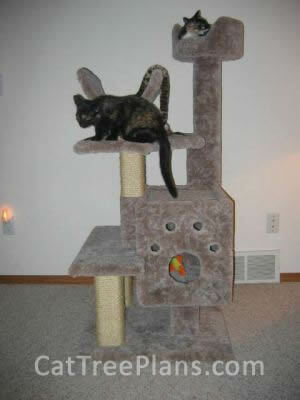 Here is Jewel and her new cat tree house. She Love's It! We love your trees! Thanks for the awesome plans! My son and I built our first with scraps found in the garage-a great learning experience. Now on to the next one! Thanks! Just wanted to say thanks for the plans and show you the result of my first attempt. 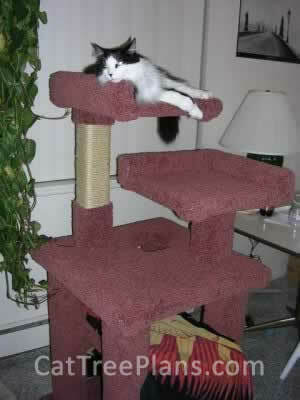 I made the perch flat for ease of carpeting, but I'm very happy with the results just the same. Great step by step instructions make this idiot proof. Thanks again. Here’s Jazz our 7 month old tabby relaxing and watching the squirrels and birds from high atop his perch on his new cat tree. I found your plans very helpful and easy to use, thank-you. I just made your Mistoffolees Castle, and I've attached some pics if you want to put them on your site. 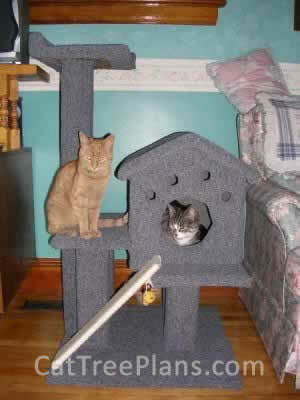 My friend and I had a fun time making the kitty condo, Total materials cost for me was $60. Not bad! I recently purchased you plans. 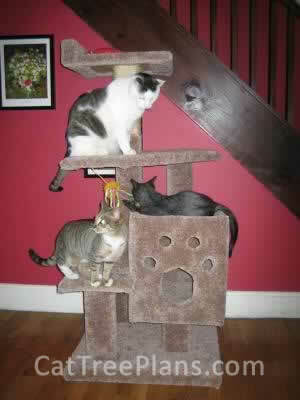 I built one of the trees and my cats love it. I have sent pics along with this email. 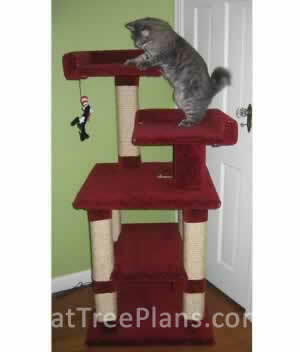 I just finished one of the cat tree plans with a couple of modifications. Thank you for the easy step-by-step instructions. 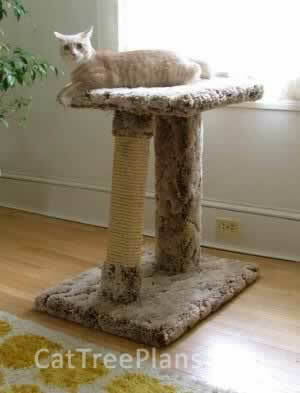 I especially found the tips for carpeting extremely helpful. 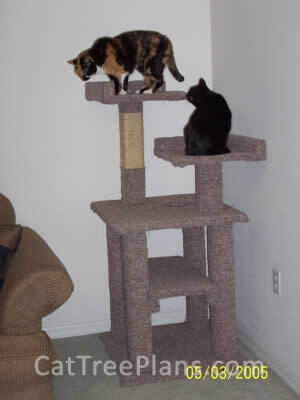 The kittens, Cali and Torti, love their new tree! This is a picture of my second tree, it's a combination of your trees as you can probably see. 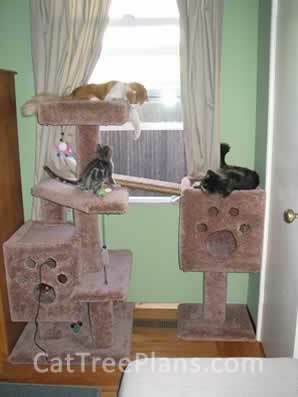 Thanks again, I really enjoyed building them and enjoy watching my cats play on them. 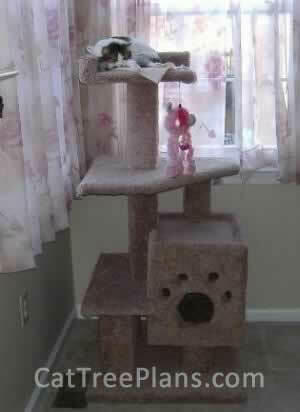 Just wanted to share with you my completed cat tree. 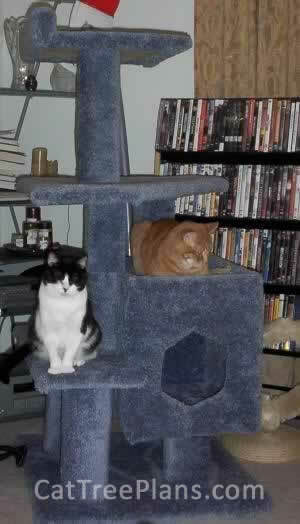 Here is a picture of Beauregard and Sinclair enjoying their new home. Thanks, the plans were easy to follow. 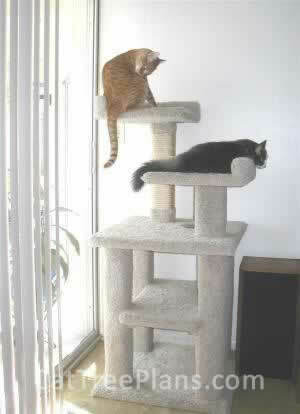 Heathcliff & Gizmo hanging out on their cat tree in Clearwater Florida. Thank You so for the plans. 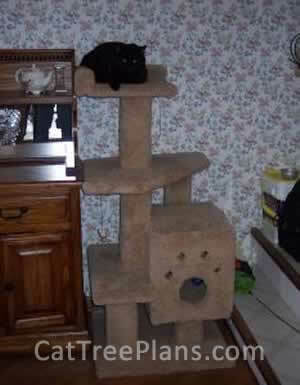 Our cats names are Abigail and Blaze. I really enjoyed making them! And they really love this one! Thanks again.